Friday, May 8 is more or less an inconsequential day to many. There are some out there whose birthday it is (in which case, happy birthday! ), but otherwise there's not a whole lot going on. Aspen Comics is taking the day to launch Customer Appreciation Weekend to celebrate another year of publishing and give back to their fans. 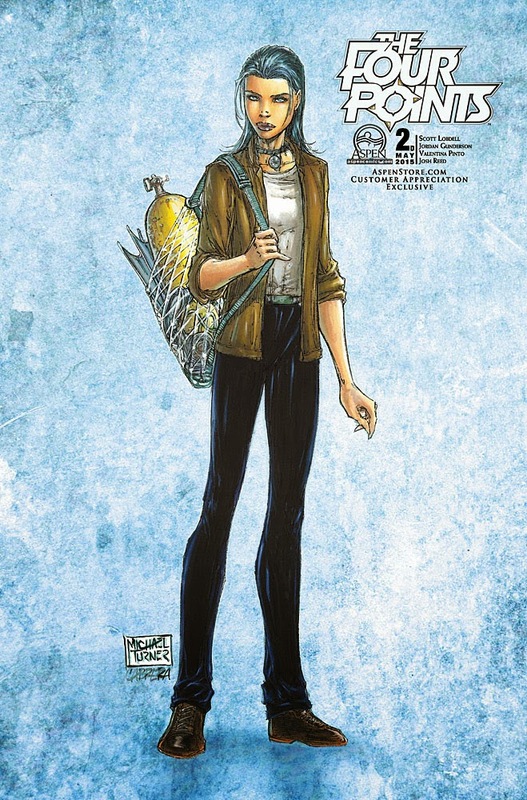 Fans can expect merchandise discounts, freebies with orders and an exclusive Michael Turner variant of The Four Points #2, which won’t hit stores until the following Wednesday, May 13th. Aspen Customer Appreciation Weekend will run from Friday, May 8th through Sunday, May 10th. Customer Appreciation Weekend will take place on www.AspenStore.com. Fans can expect a 25% discount across the entire site. Aspen fans that have participated in previous promotional events will receive codes via email for additional discounts up to 60% off store products. Each order placed over the weekend will come with bonus goodies and orders of $25 or more will receive the Turner variant. As well, the Turner variant will also be available for purchase as a print for $20, or free with a purchase of $100 or more. Aspen Comics kicks off Customer Appreciation Weekend this Friday to celebrate another year of publishing comics and give back to their loyal fans with merchandise discounts, freebies with every order, and an exclusive Michael Turner variant of The Four Points #2, which won’t hit stores until the following Wednesday, May 13th. Customer Appreciation Weekend will take place on www.AspenStore.com. Fans can expect a 25% discount across the entire site. Aspen fans that have participated in previous promotional events will receive codes via email for additional discounts up to 60% off store products. Each order placed over the weekend will come with bonus goodies, and orders of $25 or more will receive the Turner variant. As well, the Turner variant will also be available for purchase as a print for $20, or free with a purchase of $100 or more.